That sun streamed through the trees during Ryan and Alex’s sunrise engagement session at Rust Manor House, giving us the most beautiful morning light. Ryan and Alex have been dating over half a decade. They couldn’t be more excited to tie the knot later this summer! 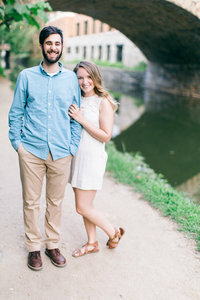 They met as freshman at Radford University, but didn’t start dating until there time in college was about to end. When asked what there favorite date night looks like, they mentioned that they love stumbling upon something fun together. Whether it be a good restaurant in a new town or staying home and relaxing by a bonfire, they are up for the adventure of it. They like to keep the pace slow, letting good times present themselves. During an adventurous trip to Colorado, Ryan proposed to Alex while they were surrounded with incredible mountain views nestled in the Uncompahgre National Forest. He knew that those mountains would stand as an unfaltering witness and an immovable symbol of the love that we will share for the rest of our lives. After he popped the question, they spent the rest of the evening lost in conversation over good whiskey and a warm bonfire – without cell service to distract them. They both are so excited to have all of their loved ones together in one place on their wedding day. They can’t wait to see everyone mingling and dancing and getting to know each other, as two families become one! There session couldn’t have been a better representation of their love for the outdoors, and their love for each other! We strolled through the grounds of Rust Manor House, so excited knowing they would soon become husband and wife.